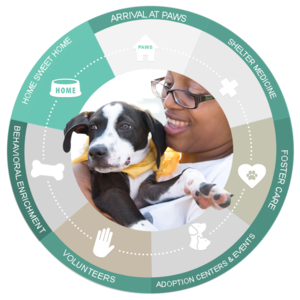 What you need to know about adopting a pet from PAWS Chicago. PAWS Chicago finds new, loving homes for thousands of pets each year. 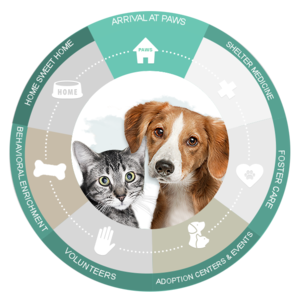 Our Adoption Centers provides homeless pets with the care and dignity they deserve while welcoming adopters and providing them with guidance in selecting their new pet. PAWS Chicago is a safe haven for homeless cats and dogs. From the moment an animal comes into our adoption program, his life is changed forever. We take in as many pets as we can save each day, providing them with quality care and a lifetime of support. Our state-of-the-art shelter medicine program uses lifesaving medical practices to provide every animal with full medical treatment, regardless of his condition. Our Medical Center is each pet’s first stop. For healthy pets, it’s where they receive medical exams, vaccinations, microchips and spay/neuter surgeries. For sick or injured pets who require more intensive care, it is a hospital that treats every pet as an individual, giving them the nurturing, treatment and rehabilitation needed to live a happy, optimal life. Many puppies and kittens need time to grow before being spayed or neutered and available for adoption. 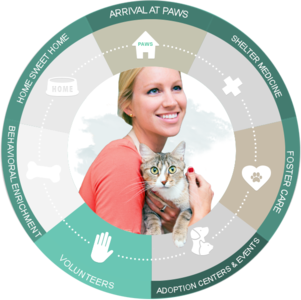 Other pets require time to recuperate from an illness or injury or time to build confidence and acclimate to living in a home environment. Sometimes they just need a break from shelter life. Our loving foster families welcome animals into their homes and give them the love and care they need to become ready for adoption. Once an animal has been medically cleared, he is ready for adoption! We have revolutionized the sheltering of Chicagoland’s homeless animals with our cageless, No Kill Adoption Centers in Lincoln Park and on the North Shore. Here, our canine and feline guests enjoy spacious suites and lots of love from and socialization with volunteers as they wait to meet their new families. 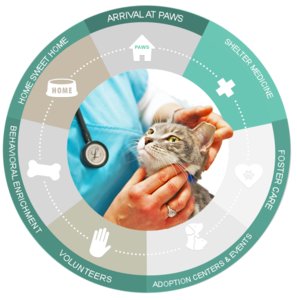 Our Adoption Centers, in tandem with innovative adoption events held in high-traffic areas, enable us to find new homes for PAWS adoptable animals. 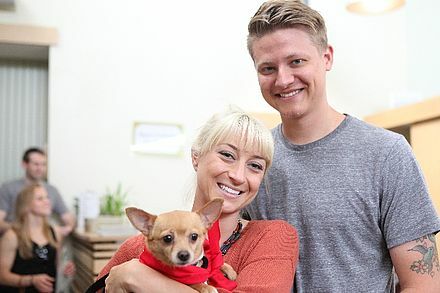 Volunteers are the life force behind PAWS Chicago, dedicating their time to helping homeless pets. Using personal expertise from their own careers and passions, volunteers play an invaluable role in every aspect of our organization, enabling us to save more lives. 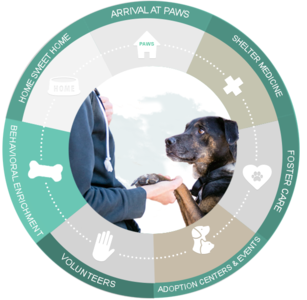 Our dedicated volunteer workforce makes it possible to provide every homeless pet with the quality care and love they deserve. Being a homeless pet is stressful. Each animal has experienced loss and many have suffered illness and emotional or physical damage. We are dedicated to caring for the physical and emotional well-being of every animal. 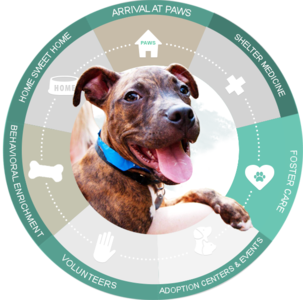 At our Adoption Centers, cats and dogs enjoy daily socialization and enrichment through playtime, walks and time with trained volunteers. Our expert trainers oversee training, rehabilitation and confidence-building for dogs who exhibit challenging behaviors like fear, anxiety or dominance. 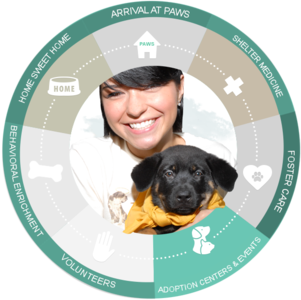 This training and support follows the animal after adoption to ensure a successful transition to their new home. At last, homeless no more! But our relationship with our animals doesn’t end with adoption. Our team of experts is available to support adopters through the transition. We also offer a lifetime guarantee to every pet in our program. While we hope our adopters and their new pets are together for life, if crisis strikes, our adopters can rest easy knowing that every PAWS pet is welcomed back at any time.